Are you a good candidate to benefit from executive or business coaching services? This anecdotal quiz is based on topics and issues addressed fully in COACHED TO LEAD. 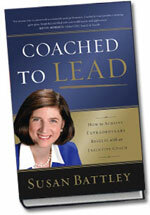 Use it to discover if you have the personal motivation and work context for achieving high-value coaching results now. Note: The quiz assumes that you have available funding or can readily obtain funding for professional coaching services. I have a strong desire to improve myself now. I have some idea of my coaching goals. I can identify benefits to achieving these goals. I am open to new ways of thinking and behaving. I can be honest with myself. I am open to feedback, even when it is mixed or negative. I can be patient when I know the payoff is worth it. I have time - or can make time - in my schedule for coaching. I typically follow through on commitments and assignments.